E-Cude 10 litre and 9 litre double compartment kitchen waste recycling bin with a brushed fingerprint proof stainless steel finish. Suitable as a small kitchen recycling bin with 2 buckets inside for waste separation. 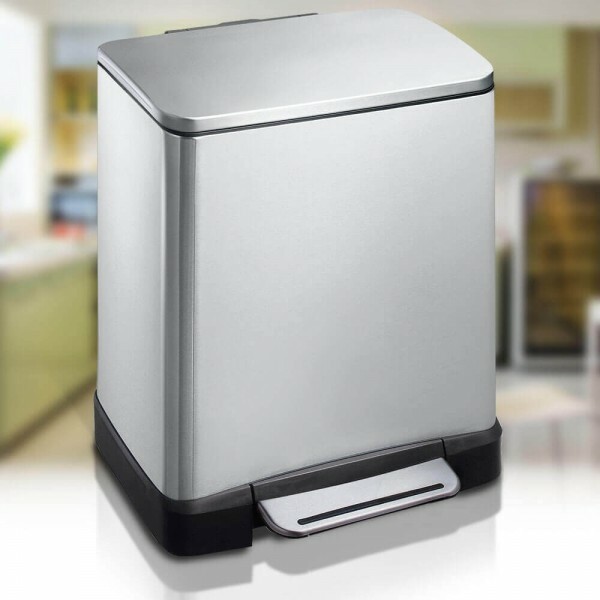 The 10 Litre and 9 Litre Double Compartment E-Cube Series is a great recycler pedal bin for a small kitchen. Keep your general waste separate from your recyclable waste and you'll find that small bins will do just fine. If you need to stand and spend a minute sorting rubbish, there is a 'Stay Open' switch so that you don't need to lean your foot on the pedal.